If you prefer words, you’ll find a number of them below. Because of the time it took to record and edit this “functional programming in PHP” video, I’m a little more brief than normal below. “Procedural” or “imperative” programming has a bit of an unearned bad reputation. This comes mostly from the fact that it’s the first and most-accessible way of writing code when you’re learning almost any language. It requires a good understanding of logic, but not need for any higher-level concepts than that. It how I wrote my first programs, and I’d guess that that is true for you as well. In procedural code, each line gives the programming language (or computer, depending how you think) a specific directive. Define this variable, increment this variable, remake this variable, loop through this set, compare these values. These are common directions in all programs, the things that makes come “imperative” or “procedural” to me is that you don’t get much more abstract than these expression. If you have “functions” in procedural code (which is quite common) they’re there as stored procedures. What I mean is that they’re sets of transformations or operations that you’re looking to be able to repeat. These operation can do anything: make files, delete files, read database values, write database values, or any combination and permutation of the above. We see collections of properties and behaviors. We know that’s a chair, and that means we can sit on it. We don’t even understand how we know that’s a chair and how we know we can sit on it. And it doesn’t matter. We understand and relate to the idea, and can use similar substitutes rather seamlessly. It’s super powerful. Similar to the way that object-oriented programming comes from the way that we understand objects, functional programming arises from mathematics and the functions we see there. (For example, y = x2.) In this way, we ignore the understanding and use of the word “function” that we have in procedural or object-oriented code. Here when we say “functions” then, we’ll often clarify that we mean “pure-functions” in the mathematical sense. It uses only it’s inputs. The parameters to a pure function are the only things that constrain or control the result. Nothing else effects it, not the time, the database, the hard drive, or the number of times it’s been called. If you’re thinking “pure functions” sound pretty useless, you’re right. That’s a good and important critique. That’s a problem that goes to the heart of why functional programming isn’t a runaway success. But for us, we can skip that worry, you’ll just have to trust me. What “pure functions” are great at is being easy to understand. Because they don’t depend on anything unstated, nor do that they do anything unstated, you can quickly read a pure function and know what it does. Obviously, some familiarity with the names of functions in the system, and the format of function declaration, is necessary. But if you get that, most functions are pretty similar to y = x2 in their clarity and simplicity. At this point, I ran out of energy. So use the little slide-in widget at right to signal to my your interest in the rest of this post. If enough people express, I’ll plan to finish the full text soon. It’s just more effort than I anticipated. Want David to Finish the Banish Loops talk article? What’s a Collection Library? Why Use One? 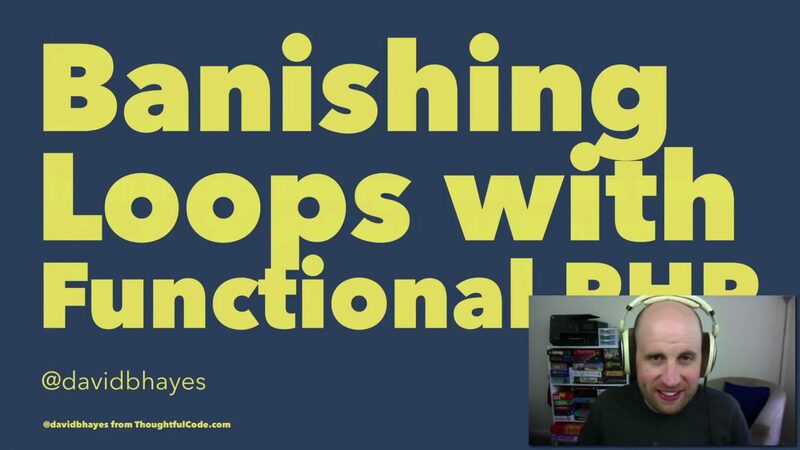 I have been programming with PHP for over 20 years, and I am just not upgrading my skill set to include functional programming (on purpose, where I have certainly done it by accident in the past) and I really appreciated this post/video.